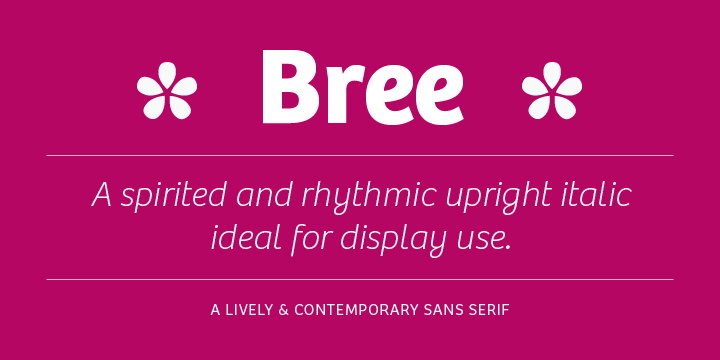 Bree font is derived from TypeTogether’s logotype. It is a very sleek sans serif that guarantees a cultured and contemporary look and feel for a variety of branding and headline purposes. The characteristic features of the font include the one-story ‘a’, the cursive ‘e’, the curves in the out-strokes of ‘v’ and ‘w’, the prosperous ‘Q’ and the variability of shapes on ‘g y z’. Alternate letters of these characters can be obtained as and when a project calls for more classical look.